keeping the pace on Beach Dr.
My running the past decade has consisted of fitness runs about twice a week, usually between four and six miles. A couple of weeks ago my teaching/running partner proposed the idea of running a half marathon. We are usually not tempted by such torture activities, but since it was in our own backyard, we decided to go for it – finish the year out in style. (or at least in shape!) 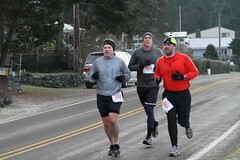 The 'Yukon Do It half marathon' course started at Manchester Park and followed Beach Drive into Port Orchard and back. I did one practice long run of eleven miles last week and decided I wouldn’t die at thirteen. This morning’s run was very cold, but there were a couple hundred other crazy people, so it didn’t feel so foolish. Don and I started at the back of the pack, so we could slowly pass runners – a great motivating strategy. The run went well, though I could feel Don’s faster pace drag me the last six miles. We crossed the line together at 1 hour 50 minutes, not enough to win any prizes, but respectable for a couple of 50+ers. We finished the morning off at the pancake house with Esther and Don’s daughter Chelsea, who documented the momentous event with her new camera. I’ll be happy to go back to my fitness running. Maybe the full marathon next year. We’ll have to think about that for a while!